The old saying “practice makes perfect” hasn’t been barked at you by every coach or P.E. teacher you ever had for nothing. Like any top athlete in their respective sport, you have to practice at the same level you want to play in competition in order to improve. The most competitive teams in the league practice two to three times a week, so make it count and show up to them. Practices help you learn how to work with your team and where your strengths and weaknesses on the court are. When your team is at its best, people will notice how you contributed to that success more. And so what if school is on break, that doesn’t mean you should be. Get in the gym, lift some weights, practice your throw, get some cardio in. Whatever it takes to keep you at your best. Just remember, know your limits. If you go too crazy and burnout or injure yourself, then you won’t be ready to play when it matters the most. So make sure you get adequate rest too. And also, HAVE FUN. If you aren’t enjoying the sport of dodgeball, then why are you playing? Pretty straightforward here. The NCDA is a pinch league, and all the best players are doing it. So why aren’t you? It takes some getting used to, and you have to build your grip strength and stamina, but it makes a huge difference in your throw speed and accuracy. Even Felix Perrone, our current league president, said that his biggest breakthrough after he joined the league was when he stopped throwing the ball like a soccer goalie and started pinch gripping the ball like his life depended on it (I may or may not have embellished what he said a little). Just do it, trust me. For all of the rookies who are in their first season playing collegiate dodgeball with the NCDA, you probably realized very quickly that our style of dodgeball isn’t what you played in middle school gym class. Fortunately for you, there are a ton of upperclassmen, team captains, and some “old head” players who are in their fourth, fifth, and maybe even sixth season (we may need to start being more strict on eligibility checks for some players) who most likely showed you the ropes when you first started. Finding a veteran player mentor is key to learning the game of dodgeball faster, learning strategy on the court, building confidence and leadership, and of course learning how to pinch the ball. Study the game from your captain or another star player on your team and you’ll be climbing the ranks in no time. You need to remember to be coachable though! No one likes working with someone who thinks they are the G.O.A.T. from the start. For all the veteran players out there, find a rookie or two and teach them the game. Not only are you feeding into the future talent of your team, but you are helping build team bonds both on and off the court. When the team is tight, individuals play better. This will also help with player retention for your club. Help the new players learn to love the sport and you will see improvement on the court. Who knows, you may just be training the next rookie of the year. In the early days of college dodgeball, game film was a little harder to come by to use as a study tool for teams and players. The film that was a little blurry, but that didn’t stop old school players from watching their team’s game footage. Nowadays, it is a lot easier to get good game footage using your smartphone, and there is a lot more dodgeball being live-streamed on multiple social media platforms, so why not take the time to study game film? Pro athletes study game film all the time in order to improve their individual and team “game intelligence”, and dodgeball players should do the exact same. Most importantly, you can see how you have improved throughout the season, and what you still need to work on. It may seem hard to get noticed out there on the dodgeball court with so many other bodies running around during a match, but I think we’ve all played against someone who clearly stood out to us amongst the rest. It may be because of their amazing arm, outstanding catches, or wild plays. It may also be because of their attitude and leadership both on and off the court. Either way, those players who focus on what they are really good at on the court and conduct themselves well during matches are the ones whose names are known throughout the league. Start modeling yourself after players who you see greatness in by finding your strengths on the court and showing it off. Former SVSU player and Baller of the Month, Lindsay Maynard Richardson, remembers players like Josh Brettrager for his sneaky cross throws and Ryan Schian for his amazing blocking. Former GVSU captain, Mark Trippiedi, was not only known for his arm and accuracy, but for his leadership of his team on the court as well. Find your niche and become the player on the court that others look at and strive to be like. Now if you’re good at arguing, I’m not telling you to argue with the officials after every big play or call, because you don’t want to be that player, trust me. If you want to play at your best during competitions, you need to prepare yourself both physically and mentally. There are a ton of ways to do that, but the best players know exactly what they need to do to get in the zone. It may be getting a good stretch and warm-up routine going before a match for yourself and your team, getting your fingers taped up (if you don’t tape up, try it sometime), or singing your school’s fight song to get you all hype. You may have a pair of lucky socks you always wear when you play dodgeball, or a playlist on Spotify the gets you pumped up. Whatever it is, find the way to get into your zone and you’ll be making some big plays on the court. Some of the best known players in the sport of dodgeball are the ones who fought hard to take their skills, their role, and their teams to the next level. Players like former MSU captain Colin O’Brien, who was the first captain at MSU to lead his team in a win over GVSU, or Cassie Weaver, who was Kent State’s first female captain, are known for accomplishing big things in the league and playing their hearts out on the court. Kyle Dattlebaum, one of the founders and former captains of the UNG Dodgeball Club, was another player who made big plays on the court and helped lead his team to multiple big-time victories. Kyle believes that a great dodgeball player should never let themselves be intimidated on the court, should step up to any situation, and should play like everyone on the other side of the court is an all-star. What do you hope to accomplish during your time in the NCDA? Now I’m not just talking about your practice habits here. I mean commitment to the sport of dodgeball as a whole. Although the NCDA and the sport of dodgeball in general has seen some significant growth over the years, it takes committed athletes and advocates of the sport for real growth and change to happen. You know the names of the players in the league who speak up (respectfully, of course) and have a voice in how the league is growing and changing. Get to know other players in the league, help the league improve, and become a player known to many. Otherwise, you’ll just be known as that one player with the good arm who plays for GVSU (you know the ones I’m talking about). 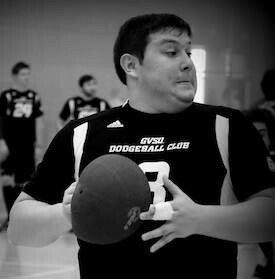 Some of the best NCDA players of all time are the ones who play dodgeball year-round. There are a bunch of different leagues across the country that you can get involved in during the NCDA off-season. Kevin Bailey will no doubt remind you any chance he gets that you should play Elite Dodgeball to continue to improve upon your skills. Playing in different dodgeball leagues like Elite will put you in new gameplay situations, teach you new strategies, and keep that arm from getting rusty over the summer. Yes, even playing in a foam league helps. Also, pretty straightforward here. You’re going to take a dodgeball or two (probably way more) to the face during your time playing dodgeball. It is a part of the game. Never let that make you afraid to play the game though. People will remember whether or not you stood back up and walked it off after that jolt to the head from a sneaky cross throw, and they won’t judge you (too much) if you shed a few tears because they’ll be more impressed when they see you back on the court for the next point ready for action. Did we forget anything on this list? Comment below and let us know what you think makes an All-Star Dodgeballer. If you want to read more on some key traits and skills every dodgeballer should have in there arsenal, read Sam Hiller’s “The Traits Of An NCDA Dodgeballer” which was part of his “Dodgeball 101” series.